Recently I discovered Tea Sparrow – a locally based tea box subscription company that ships out monthly subscriptions of teas within North America. 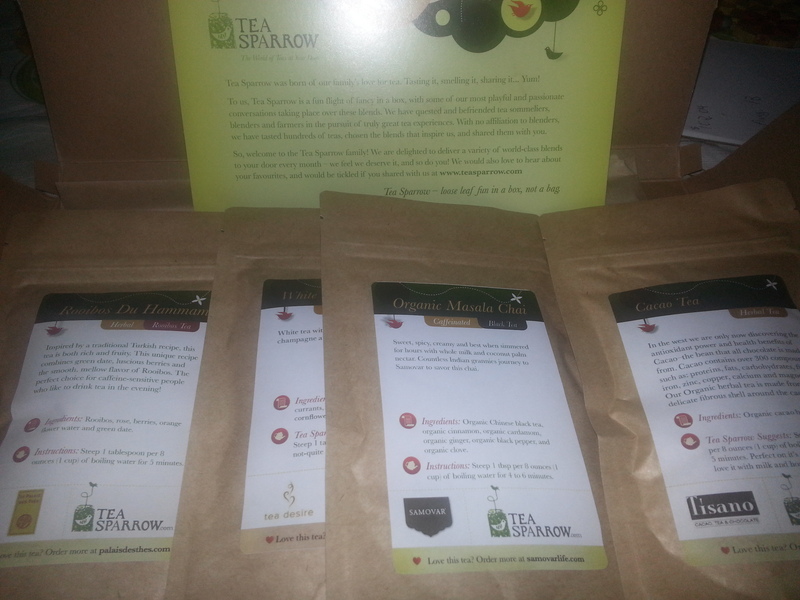 As a trial, I received the March 2014 box complimentary from Tea Sparrow. I was excited to receive the box in the mail which contained 4 packages of loose leaf teas with varying caffeine options. I received 2 herbal teas and 2 caffeinated teas in my box: Organic Cacao Tea, Rooibos Du Hammam, White Tea Champagne, and Organic Masala Chai. One box with 4 packages of loose leaf teas it claims to be able to provide up to 35 cups of tea. 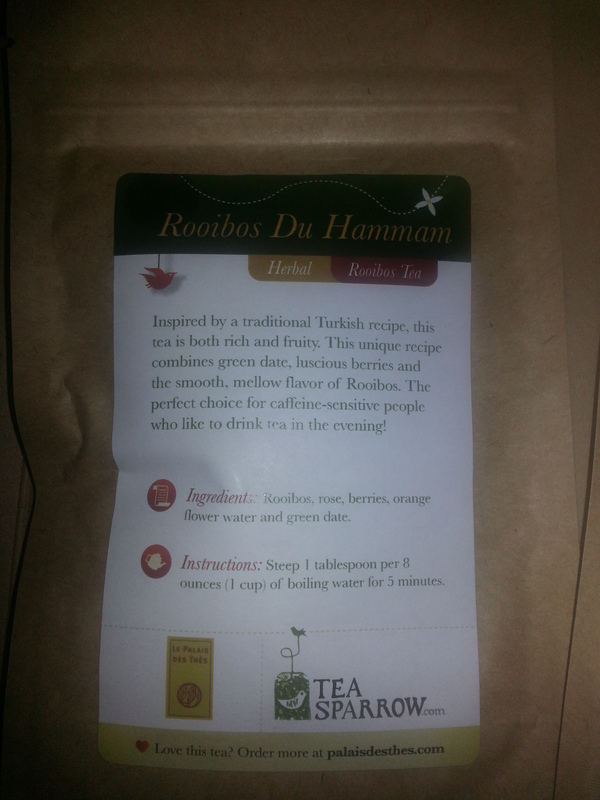 I rarely drink caffeinated tea – only in the mornings as a “wake me up” – I prefer the herbal teas, especially Rooibos, so was excited to try the Rooibos Du Hammam – the first of the four packages I opened when I received the package. I love the scent of bubble gum this tea provided. I could smell these tea all day! Consisting of Rooibos, rose, berries, orange flower water, and green date, I really enjoyed this tea with a little bit of honey or organic agave sweetener. This tea is sold by Le Palais des Thés, a French tea company that has stores in France and New York City. Luckily for me, if I finish my batch, I can order some online and have it shipped (shipping charges apply). Hopefully in the future we can see these teas being sold in Canada, so it’s more convenient! 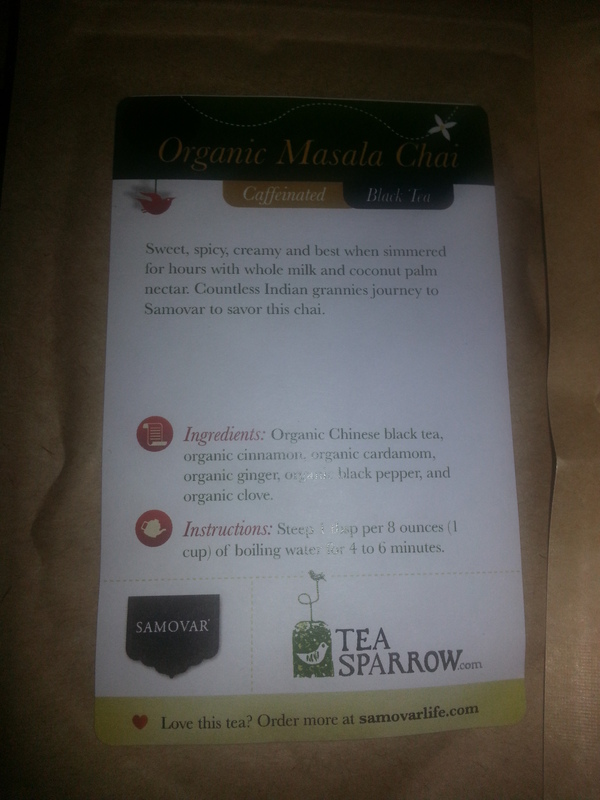 The second tea I opened up was the Organic Masala Chai from Samovar Tea Lounge, which was very aromatic. I love the smell of chai and the milky flavors it produces. I steeped my chai tea and added some steamed soy milk and honey to make it. Definitely a great afternoon tea to enjoy. Note: this tea is caffeinated. I prefer it more milky, so I ended up with a 50/50 ratio for water and soy milk. It’s not as strong as some other chai teas I’ve tasted in terms of spice, however the organic spices are highly enjoyable. 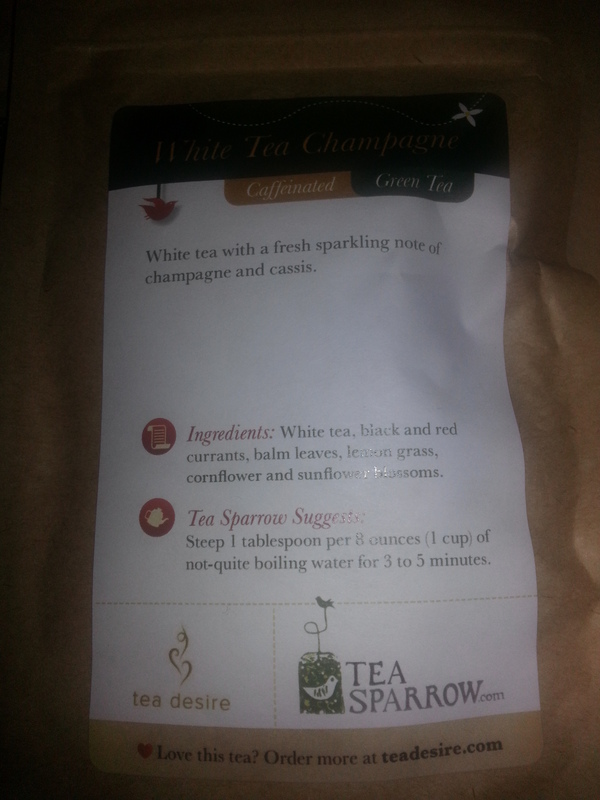 The White Tea Champagne from Tea Desire tea leaves was intoxicating with the aromas that came out of the bag upon opening it! Quite sweet on its own, I added a little agave sweetener to it and made for a great afternoon tea. I particularly loved the smell of the tea where you can smell the hints of currants. 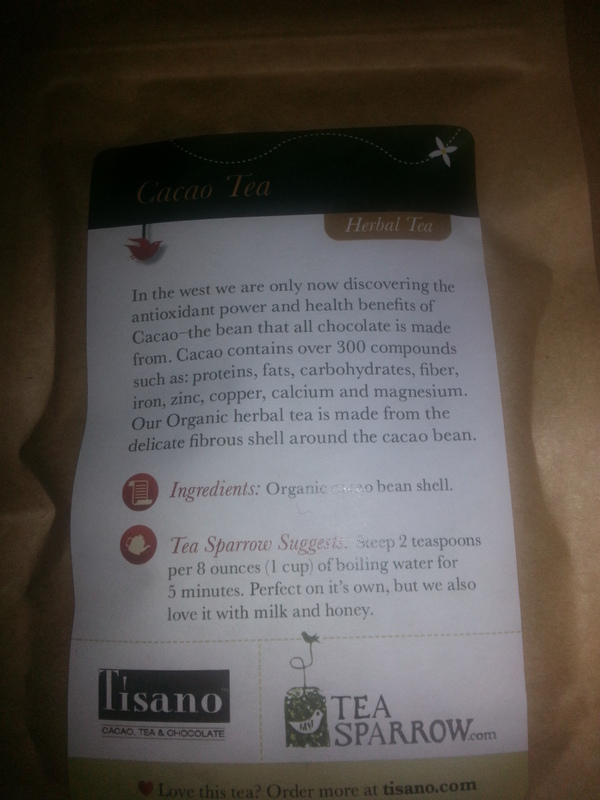 The final tea I tried in the series was the Cacao Tea from Tisano, an award winning chocolate herbal tea. Made from pure organic cacao, this tea when accompanied with some milk and honey resembled a light hot chocolate! I enjoyed the constant smell of chocolate when this tea is brewed and would recommend for someone who wants a less sweet alternative to hot chocolate. Overall Tea Sparrow offers a variety of options for their monthly tea subscriptions from $20+ depending on the number of months you are signing up for or a continuous membership. Currently Tea Sparrow is offering a discount for all AliceinAdventureland readers – 60% off your first month’s Tea Box on a continuous ongoing subscription to their service. Visit their website: http://www.teasparrow.com/promo/ and enter code teas to receive the one time discount. Great option to give as a gift to a tea-loving friend or family member as well!